Members are reminded that our Rules currently dictate that ballot papers are received two weeks before the ballot opens: your vote will be deemed invalid if AEC receives your vote before the ballot period commences. Members are advised that after each election conducted by the Australian Electoral Commission, AIMPE receives a post election report on the conduct of the election. A copy of each post election report may be obtained from AIMPE. The ballot for the Victoria Tasmania Branch positions has been concluded. 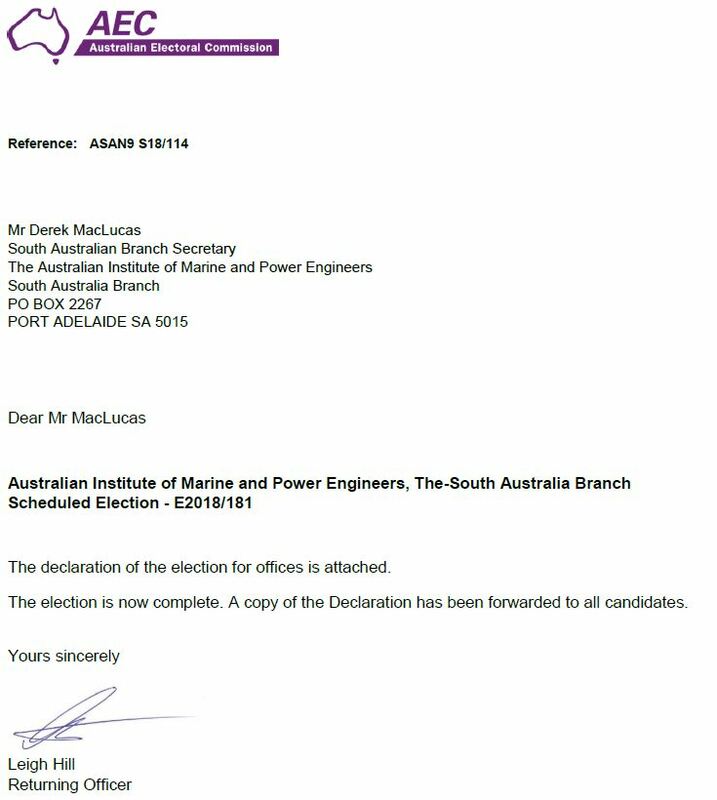 The Australian Institute of Marine and Power Engineers Election of Federal Executive E2017/275 was conducted by a Returning Officer from the Australian Electoral Commission at the Federal Council in Newcastle on Monday 18th June 2018. The Australian Electoral Commission has issued a post-election report. AIMPE is required to respond to the post election report and is preparing a response. Below are the results of the election for the following offices, conducted in accordance with the provisions of the Fair Work (Registered Organisations) Act 2009 and the rules of the organisation. As the number of nominations accepted did not exceed the number of positions to be filled, I declare the above candidates elected. As this election is for the NSW District it is not conducted by the Australian Electoral Commission. Instead it will be conducted by an independent Returning Officer approved by the Industrial Commission of NSW. If a ballot for any position is required, eligible members of the District will get a ballot paper in the post. The NSW District includes all of NSW and the ACT so financial members of the Sydney and Newcastle Branches are all members of the NSW District. 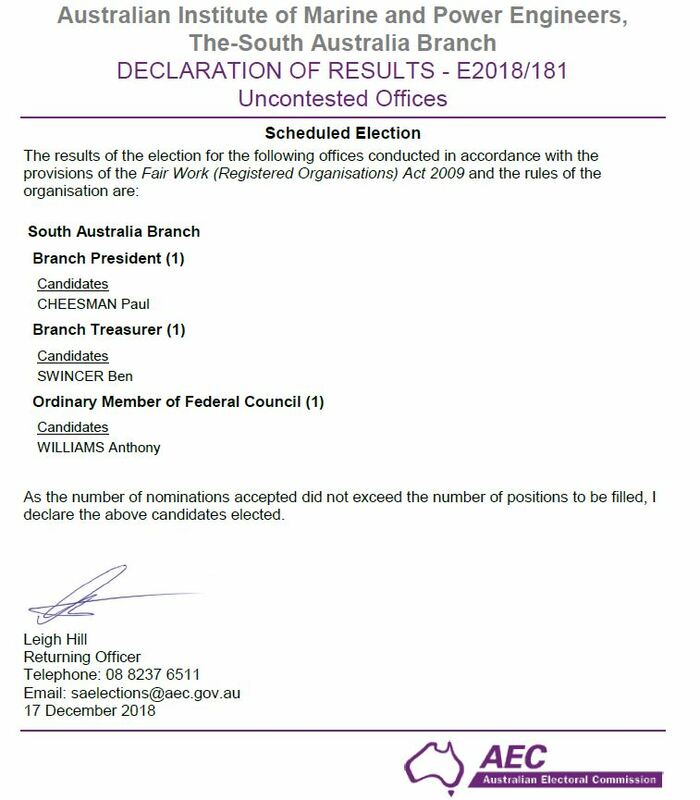 The Returning Officer from the Australian Electoral Commission has issued the Declaration of Results of th election for Sydney Branch Executive positions and for Ordinary Members of Federan Council. After each election the Returning Officer is also required to issue a Post Election Report. Once the Post Election Report is received it will be uploaded to this section of the website. All Sydney Branch positions are due to come up for re-election in the second half of 2017. The Branch has had detailed correspondence with the Fair Work Commission [prior to the establishment of the Registered Organisations Commission on 1st May 2017] about the problem of having the current terms of office expire on three different dates. 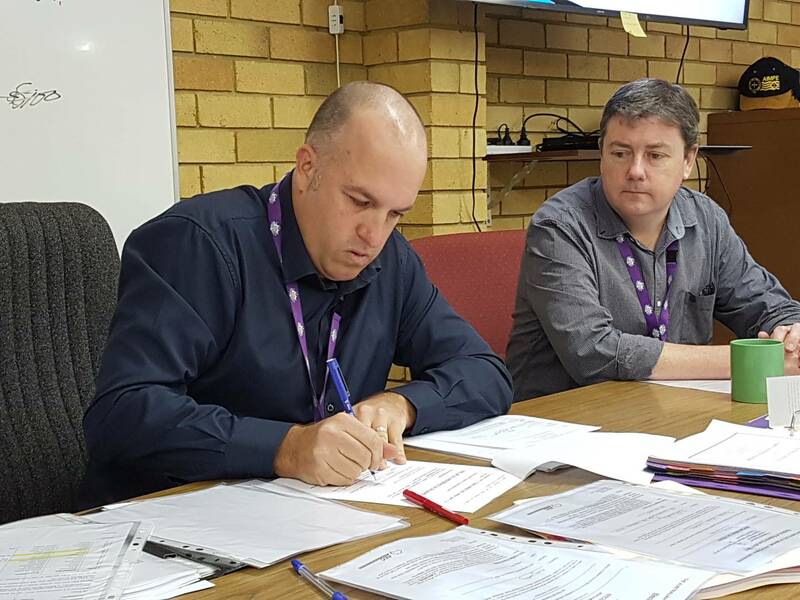 The Fair Work Commission strongly recommended that only one election process should be conducted and that this would bring the dates all back into alignment. This was accepted by all current office holders. The FWC then appointed the Australian Electoral Commission to conduct the elections. The Election Notice was published in the May 2017 edition of On Watch. 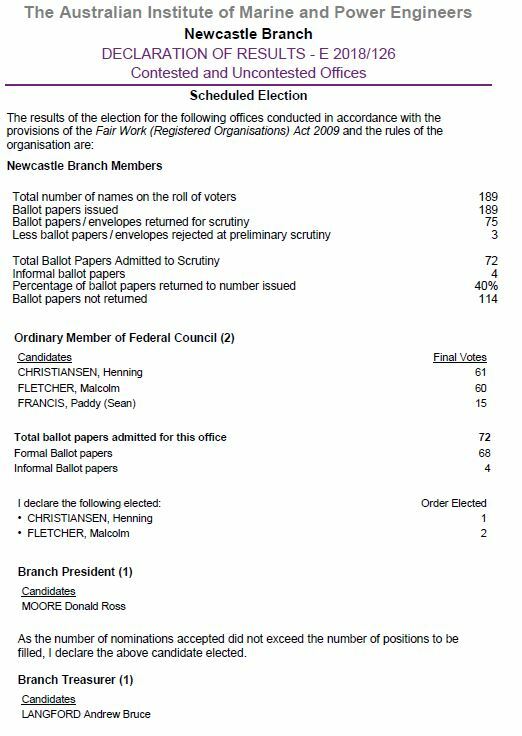 The Australian Electoral Commission has provided a Post Election Report regarding the recent election for the position of Branch President for the Victoria Tasmania Branch. AIMPE is required to provide a response to the Post Election Report and will do so in due course.